Last week, British pound traders failed to react to friendly economic news which signaled that their attention was focused elsewhere. And it was- on the summit in Brussels between the U.K. and the European Union. The purpose of the summit was to discuss the U.K.’s membership in the EU. On Thursday and Friday, British Prime Minister David Cameron was negotiating with EU leaders in Brussels about the U.K.’s membership in the union. The talks continued well after the European market close on Friday. After the U.S. market close, Cameron said he “negotiated a deal to give the U.K. special status in the EU” and believed it is enough to recommend Britain stay in the union. The news triggered a short-covering rally into the close on Friday. However, conditions were about to change on Monday after London mayor Boris Johnson decided to up has campaign for Britain to exit the EU. This news triggered a break that could eventually lead to the Sterling’s biggest single-session loss since October 2009. According to the daily GBP/USD chart, the main range is 1.4078 to 1.4667. Its retracement zone is 1.4372 to 1.4303. This zone is controlling the short-term direction of the market. 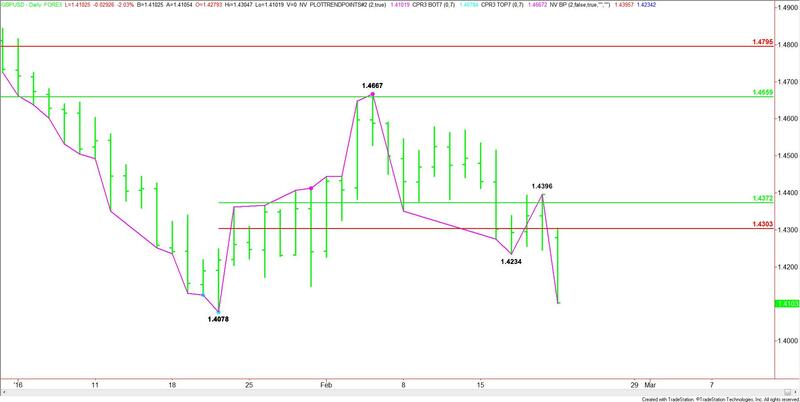 On February 19, the short-covering rally attempted to take out the 50% level at 1.4372, however, there was no follow-through rally early Monday and the forex pair gapped under the lower, or Fibonacci level at 1.4303. The break under 1.4303 signaled the presence of sellers. This eventually led to a break under the bottom at 1.4234, triggering an acceleration to the downside. Based on the current downside momentum, it looks as if sellers are going to go after the January low at 1.4078. This is also another trigger point for an acceleration to the downside. The early price action indicates that traders are heading into a volatile trading period. It also suggests that we could see further sterling weakness ahead of the vote itself for the U.K. to remain a member of the EU. Although Cameron believes the U.K. should remain a member, the reaction to Johnson’s campaign against membership seems to indicate lingering uncertainty ahead of the referendum later this year. When investors are uncertain, they tend to lose confidence. When they lose confidence, they sell, and this is what is driving the British pound lower. If the uncertainty continues then we could see the GBP/USD at substantially lower prices over the near-term, or until a voice of reason emerges that sways the consensus in the other direction. Moody’s credit rating agency even chimed in about the situation. It said that the “economic costs” of a decision to leave the EU would “outweigh the economic benefits”, and that it would consider “reflecting those threats to the U.K.’s credit standing by assigning a negative outlook to the sovereign Aa1 rating following a vote to exit.” Lowering the credit rating would not be good for the British pound. The fact that there is still time before the referendum vote means that investors should brace for a period of extreme volatility in the GBP/USD. At this time, the bears have the upper hand and are pressing the market lower. It’s an early battle in the process, but it looks like Johnson’s campaign to leave the EU is winning over Cameron’s campaign to remain. Conditions are going to change several times before the vote take place so the numbers in the polls will dictate the direction and the volatility of the GBP/USD over the near-term. Traders should go with the trend, but be prepared for stops and starts and several changes in direction until a decision is reached. James A. Hyerczyk is a financial analyst for FX Empire, a leading financial portal. James has worked as a fundamental and technical financial market analyst since 1982. His technical work features the pattern, price and time analysis techniques of W.D. Gann.